In this chapter the real-time testing technique which has become known as real-time dynamic substructuring is discussed. 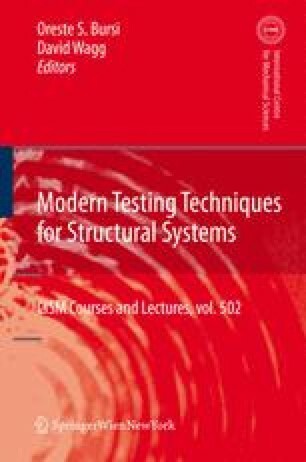 A control systems approach is taken to develop stability and robustness criteria for real-time dynamic substructuring tests. In particular we discuss how delay and uncertainty effects in the experimental apparatus can lead to loss of accuracy, or worse, system instability. Models which take account of the delay effects are developed using both delay differential equations and transfer functions. From these models delay compensation schemes can be constructed either using inverse transfer functions or forward prediction methods. Three methods for improving robustness are described for use in combination with a delay compensator. Throughout the chapter experimental results are presented, and in the final part results from an industrial example of substructuring a helicopter lag damper are discussed in detail. David Wagg is supported by an EPSRC Advanced Research Fellowship. The authors would also like to acknowledge the work of Max Wallace and Alicia Gonzalez-Buelga, who produced many of the experimental results shown in this chapter. MW was supported for his PhD studies by an EPSRC DTA and AGB is supported by EPSRC grant (GR/S49780). Peter Gawthrop is a Visiting Research Fellow at the University of Bristol.